What a day yesterday was on the mountain! We saw an unexpected dump over the “Magic Foot”. In addition to what fell throughout the day, we had another 10 centimetres fall up top overnight. That’s pushed that base back up near the three-metre mark. With more on the forecast, winter is definitely back after that little break we had for a while. There’s snow of some measure on the forecast for every day of the coming week. But we needn’t look too far ahead as tonight looks to be the night, making tomorrow the day! Beyond that, we should be enjoying a fairly powdery week ahead. 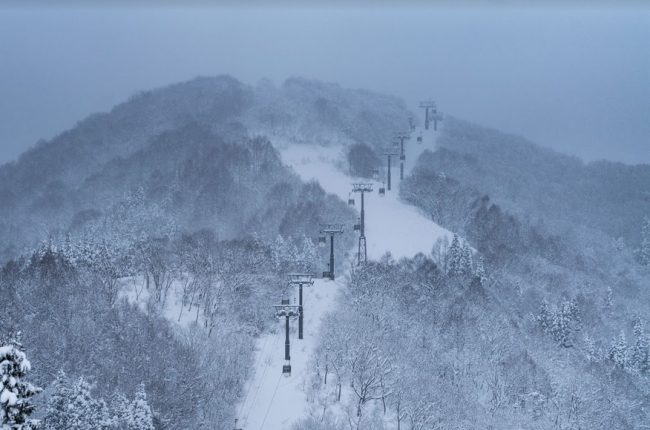 For those up for something a little different that you’ll only ever see in this part of the world, the Iiyama Snow Festival is on this weekend. A myriad of different snow sculptures are scattered along the streets of the central part of town. There is also a fire festival and an ‘omikoshi’ parade shrine procession which is one of a tiny few which take place on the snow. Take your jackets and gloves and head in for the night or if you need a break from the mountain, the festival continues tomorrow. With all this snow around, you’re going to want to enjoy it as much as possible. You don’t have to be a first-timer to benefit from an instructor’s guidance. We have great English-speaking in-house instructors. They are experts in both skiing and snowboarding and will be happy to give you some tips no matter what level you are: beginner, intermediate or advanced. At the end of a day sliding down Mount Kenashi, food and/or beer and an onsen is usually on the minds of most. It’s always a good idea to reward yourself – you deserve it! Check out our Restaurant and Bar Guide to help with satiating hunger and thirst. While you’re here, give a few minutes of your time to our ever-popular “How to Onsen” video. It’ll help you get up to speed with ettiquette so you can onsen like a local.